Tiered Plant Stand Planter Corner Rack Rustic Patio Unique Multiple Plants Pot Rack Set of Three Outdoor Furniture & E book By Easy2Find by STS SUPPLIES LTD at Tulips Orchids. Hurry! Limited time offer. Offer valid only while supplies last. 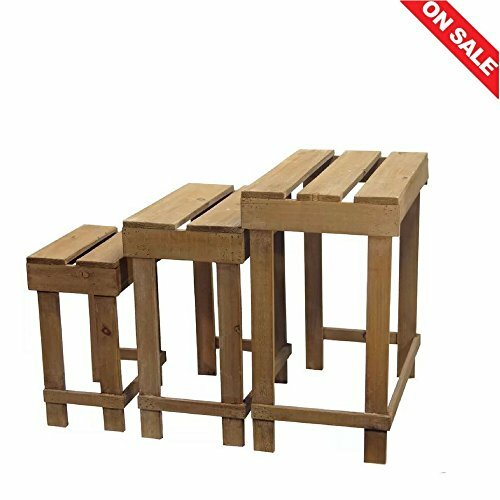 SET INCLUDES:3 Racks Product dimensions: Small:8.69 i. deep, 15.98 in. tall, 10.57 in. wide. Medium:12.69 i. deep, 19.98 in. tall, 15.57 in. wide. Small:8.69 i. deep, 15.98 in. tall, 10.57 in. wide. Medium:12.69 i. deep, 19.98 in. tall, 15.57 in. wide. Large:12.69 i. deep, 22.98 in. tall, 20.57 in. wide. Tiered Plant Stand is a Rustic Pot Rack for your Garden or your indoor Plants,Bringing the Best out of Style and Practicality. The Classic Rustic Design along with the Elevated Storage Space will Provide you with Many Decoration Ideas in your Garden or Yard and will Stant Many Years of Use. The Beautiful Design will Make it the Perfect Indoor Decoration Protecting your Sensitive Plants to an Enclosure Environment.